I'm on a little roll, looks like there will be some Christmas blog candy, keep checking back. I'm not much on using glitter, but this glitter from PK Glitz the can be heat embossed doesn't quite get all over everything like regular glitter. It's pretty cool, I used my trusty glue pen on the snowflake, sprinkled with green glitter, gently shook off the excess, then heat embossed. The little red dot was already like that when I bought them. I did the little green heart the same way. Stamptacular Sunday Challenge Challenge #36: Let It Shine! Supplies: White Card Blank 5" X 7" Oriental Trading Co., Papers: AC Patterned Paper Michael's, Stamps: Clearly Wordsworth V007 Carolers, Ink: VersaMark Ink Pad, CTMH-red embossing powder, glue pen, PK Glitz Glitter, American Craft Elements-ribbon, glitter dome stickers, pop dot, glue dot. Love the layout and colour scheme. A great card. Thanks for sharing it with us at The Pink Elephant. What a lovely Christmas card! Great layout and papers, and that snowflake sure do shine! Glad you could play along over at Card Patterns. Thanks so much! wow, this is so very cute, great job..have a wonderful day! 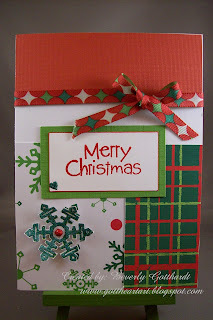 A fab card, I love the colour combo. Thanks for joining us at SSC. Cute card! I like how you combined the different papers. Thanks for joining us at the SSC. Love the 3-D snowflake, such a fun holiday card...very nice job! I'm so glad you could join us this week at the Stamptacular Sunday Challenge! Beautiful!! love the papers you used. Great take on all the challenges.Thanks for joining SSC this week..hope to see again next week. What a great card. What a shiney snowflake. Thanks for joining in at SSC.